Technology can be frustrating. One of the most effective B2B marketing tactics is the use of humor to demonstrate empathy. It shows prospects and customers that you understand what they experience, pain points, and common IT issues - and that they're not alone in the struggle between man and technology. Think about the commonality of the phrase 'Did you try turning it off and turning it back on again?' Everyone, from end users to CIOs, have experienced a situation where a technology issue has resulted in an unpleasant call with tech support. Our Tech Toons take common technology pain points and turn them into a humorous way to reach out to your clients, prospects, peers, and practically anyone else. 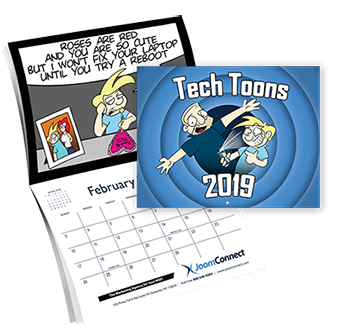 This 12-month calendar is based off of Tech Toons, the popular comic created in house and available exclusively through the JoomConnect newsletter service. Each calendar month includes conventional holidays, as well as, a few technology-related dates, like World Backup Day and Disaster Preparedness Day. 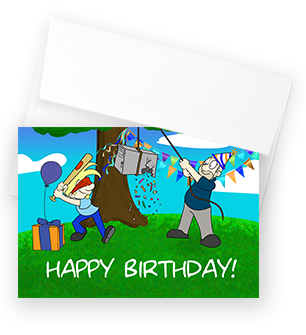 The Tech Toons Birthday Card is a unique touchpoint that’s sure to leave a lasting impression. Give one of these cards to your clients’ on their birthday as a way of letting them know how much you appreciate them. Select from One of our Pre-Written Greetings or Provide a Customized Greeting! Sometimes, IT support can be sweet - especially on your birthday! Here is a special birthday wish for a special client who has a special place in our hearts. Happy birthday! Today is the only day that we’ll condone this kind of computer maintenance. Enjoy! Sorry you have to scroll so far down the menus on websites to choose your birth year. Good news and bad news - this card has a clear cache, but is clear of cash. Here’s hoping that your EOL is a long ways away!